For mashed potatoes, taste and texture are most important and it is largely determined by the quality of potatoes used. 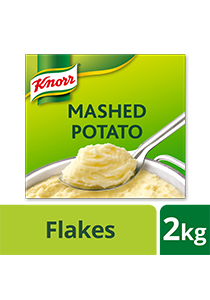 Knorr Mashed Potato is created with 99% real potatoes to give you authentic potato taste in just a few minutes. All food additives are of plant and synthetic origin. 1. Boil 9 litres of water with 70g salt. Switch power off. 2. Add 4 litres of cold water (or cold milk). Important: Do not exceed temperature of 85°C. 3. Briskly stir in 2kg potato flakes with a wired whisk. 4. Stir briefly again after 2-3 minutes until smooth.